Knights of Veritas uses high quality replica steel armour to faithfully depict the armour of knights in the late 1300s. Our armour looks and feels like the historical iron and steel originals, including accurate weight, mobility and protective quality. A full suit of our armour weighs about 60 lbs., just like the originals, but the weight is well distributed across the body thanks to the accurate design and even the accurate clothing which is worn under it. Battlefield armours such as these required the versatility to fight both mounted and on foot, and could not be excessively heavy and restrictive or they would endanger the wearer. Among the audience's favorite items are the shirts of mail armour (often incorrectly referred to as chain mail.) Each mail shirt is comprised of tens of thousands of individual rings woven together in a mesh, with the ends of each ring overlapped, pierced and closed with a tiny rivet, just like the originals. This authentic, labor-intensive armour is a far cry from the many kinds of costume garments, intended to look like mail armour, which most people have seen. All of our armour is hand-crafted, with authentic details inside and out, right down to the buckles and the padded liners inside the helmets. The plate armour is carefully shaped, with rounded surfaces designed to deflect attacks in the same manner as the originals. Most of the different pieces of plate armour are made of stainless steel. This is the one area we compromise on for the sake of convenient modern materials, simply because the frequent maintenance on rust-prone regular steel armour is so time consuming. The difference between regular and stainless steel is not visible to most peoples' eyes, and there is no significant difference in the weight. 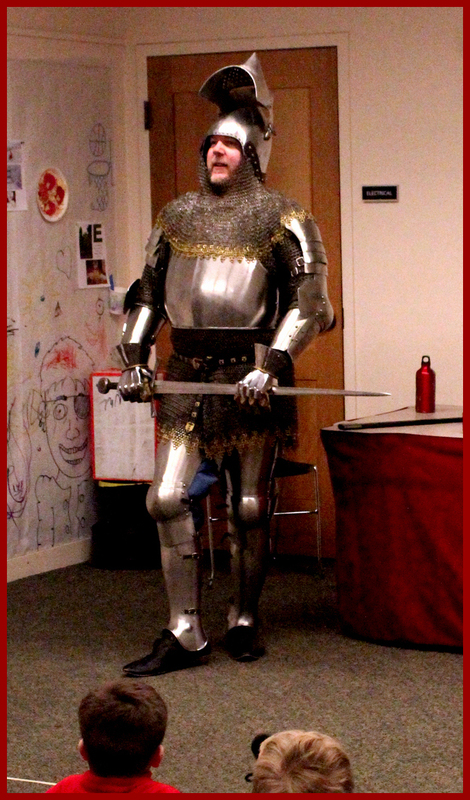 One of the highlights of any Knights of Veritas presentation is the opportunity for the audience to handle and even try on pieces of armour. Helmets and gauntlets (armoured gloves) are always the most popular items. 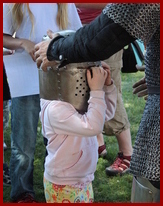 The Knights always try to emphasize to younger members of the audience that the armour they try on is built to fit grown-ups, so they don't come away with the incorrect impression that it is disproportionately heavy. Like the effort that goes into any sort of physical activity today, a knight in the middle ages was trained and conditioned to feel comfortable while wearing the armour.